Nothing defines Lowcountry Lifestyle as much as living and dining outside. But, we no longer want just a patio set and a Weber grill. Weatherproof cabinets, built in grills, outdoor lighting, furniture groupings, fireplaces, and music systems are all migrating to the backyard, basically extending our living space. After all, that's why you live on The Grand Strand, isn't it? 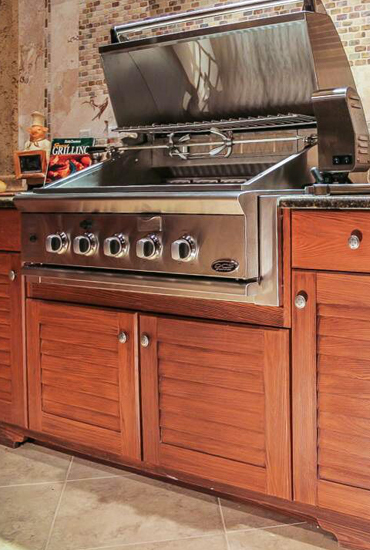 We have outdoor kitchens, grills and accessories to fit every budget and every style. We also have a Certified Kitchen Designer (NKBA) on staff to help you design you new kitchen, as well as your entire outdoor space. Please browse our cabinet and grill lines and call today to schedule your appointment to start living the dream of the Lowcountry Lifestyle. An outdoor kitchen from Challenger Designs is a dream of convenience from the best in the industry. The sleek elegance of each piece of furniture holds up to the test of time. Challenger has a wide range of preconfigured kitchens to choose from - we can also work with you to custom design the perfect solution to your exact needs. CHALLENGER DESIGNS cabinets feature rigid aluminum construction. They will not rot, warp or rust, offer weathertight storage and are available with a coordinating, affordable refined bull-nose aluminum countertop. Visit www.challengerdesignsllc.com for more information. For a more custom look, we offer cabinetry from Naturekast. Discover the rich look of real wood outdoor cabinets without the constant maintenance.ï¿½ NatureKastï¿½has revolutionized theï¿½outdoor kitchenï¿½industry by offering the first 100% weatherproof cabinet using a technologically advanced hi-density resin system that perfectly replicates the natural color and texture of real wood. 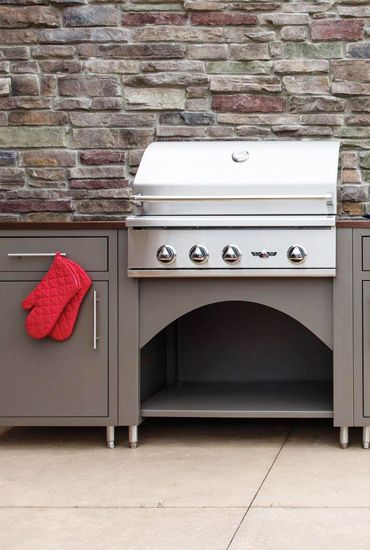 Enjoy unlimited design options for your outdoor kitchen area, along with the widest range of outdoor TV cabinets, decorative molded elements and full-access appliance cabinets. NatureKast outdoor kitchens. Perfecting the art of outdoor living. Visit www.naturekast.com for more information. 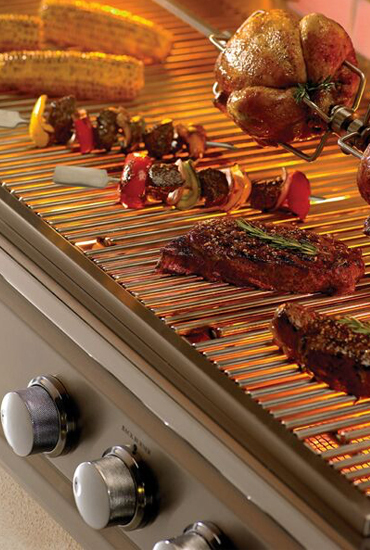 Whether built-in or free-standing, Summerset has a grill for you ï¿½ one that will last a lifetime. Built-in and stand-alone grills from Summerset Professional Grills use commercial-grade outdoor, high quality #304 stainless steel and provide high BTU output. ï¿½Luxury meets raw horsepower. Visit www.summersetgrills.com for more information.